"Something reptilian he felt here, something that had endured by immobility, a kind of life out of reach, like the crustaceans in their armour." First serialized in six installments in the Forum from January to June, 1927. Published by Alfred A. Knopf. on September 2, 1927. Published by William Heinemann Ltd. in November 1927. Published by Alfred A. Knopf on November 9, 1929. Published by William Heinemann Ltd. in May 1930. Published by Houghton Mifflin Co. in 1938. Armed Services edition, published by Alfred A. Knopf in 1943. Published by University of Nebraska Press in 1999. Historical Essay and Explanatory Notes by John J. Murphy. Textual Editing by Charles W. Mignon with Frederick M. Link and Kari A. Ronning. By Harold Small, published in San Francisco Chronicle on March 23, 1931 and collected by L. Brent Bohlke in Willa Cather in Person: Interviews, Speeches, and Letters. 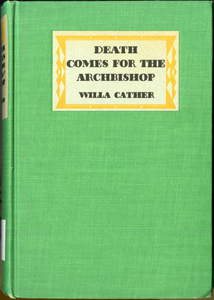 Willa Cather Raps "Sincerity Heresy"
By Harold Small, published in San Francisco Chronicle on March 29, 1931 and collected by L. Brent Bohlke in Willa Cather in Person: Interviews, Speeches, and Letters.